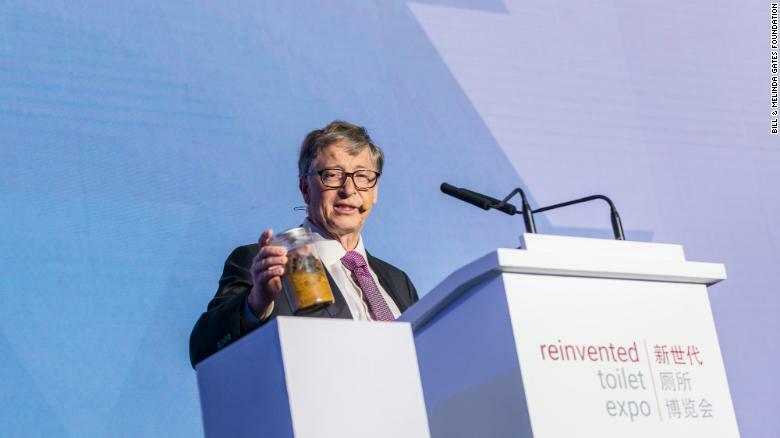 Bill Gates shocks the audience with a jar of human excrement. Beijing (CNN) Bill Gates stunned the crowd in Beijing on Tuesday with a jar of human feces in his hand. The Microsoft founder was hosting the Reinvented Toilet Expo. His pitch? To commercialize futuristic toilets that don’t need water or sewers. “Today, rich countries have a sewage system where you bring water in, put the human waste in it and it goes out to all the way to a treatment processing plant,” Gates told CNN. According to the WHO, around 2.3 billion people still do not have basic sanitation facilities such as toilets or latrines. Lack of clean sanitation comes at a staggering financial cost — The Gates Foundation estimates $223 billion a year in the form of higher health-care spending and lost productivity and wages. Through the Gates Foundation’s “Reinvent the Toilet Challenge,” Bill and Melinda Gates have given $200 million to teams seeking to develop waterless toilets over the past seven years. To compete in the challenge, toilets had to cost less than 5 cents a day to operate, without the need for external electricity or running water. The foundation funded scientists to invent toilets that are self-contained — they take human waste, kill dangerous pathogens and convert the resulting material into products with potential commercial value, like clean water, electricity and fertilizer. 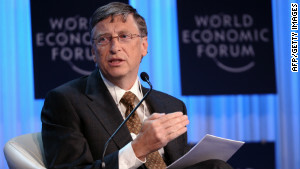 Gates chose to sell his pitch in a country that has struggled with clean sanitation. In 2015, Chinese President Xi Jinping called for a national “toilet revolution.” The world’s second-largest economy since 2010, China has made significant improvements in public hygiene, but many rural towns still do not have access to modern toilets. Gates noted that the production of these toilets is in its initial phase, and that it will be at least a decade before reinvented toilets reach the masses in the poorest areas. “The very first ones are still fairly expensive. It’s gonna take time before we get the volume to really take down to the low end of the market,” Gates said.